Diamond/Pearl Its huge mouth is almost seven feet across. It has enough power to completely crush a car. Platinum It is surprisingly quick to anger. It holds its mouth agape as a display of its strength. Heart Gold It brandishes its gaping mouth in a display of fearsome strength. 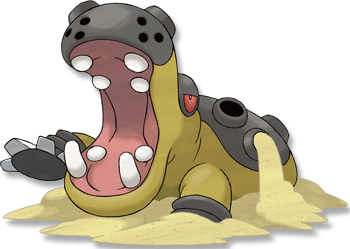 It raises vast quantities of sand while attacking. Soul Silver It brandishes its gaping mouth in a display of fearsome strength. It raises vast quantities of sand while attacking. Black It is surprisingly quick to anger. It holds its mouth agape as a display of its strength. White It is surprisingly quick to anger. It holds its mouth agape as a display of its strength.